Tallahassee is known for its many trees; therefore, it only seems natural that treehouses are part of a childhood here. Photo courtesy of Images/shutterstock.com. If you’ve ever thought about building a tree house for your kids but have held off because you had no idea where to begin, know that you’re not alone. Know, too, that Tallahassee Magazine has got you covered with these helpful design and construction tips. The first step you’ll need to take is to find out whether or not you’ll need a special building permit. Does your neighborhood have certain covenants or codes when it comes to tree houses? Once you’ve got that figured out, you can move on to actually designing the tree house. If the idea of designing a tree house from scratch is too daunting, you can always purchase a freestanding, pre-fabricated play-set with a tree house tower. These kits are available from Home Depot, Lowe’s or Wayfair. Assembling a pre-fabricated tree house is much easier than building one, but the result is never as unique as a hand-built, elevated platform set among the trees. If you’re willing to go the made-from-scratch route, consider your kids’ ages. Age will determine the size of the tree house, its height from the ground and the type of ladder or steps you — or someone else, depending on whether or not you have carpentry skills — will build to access it. Select the tree house’s location. Most tree houses get their interior light from the sun, so choose a nice, sunny spot. Depending on the size of the tree house and the complexity of its architecture, you may need to bring in a tree specialist to determine if the tree you’ve selected is sturdy enough to support your kids’ special hideaway. Think about the tree house’s design. Would you like it to blend in with the woods, or would you rather it match your home? And what about a special theme? Maybe you’re willing to let your kids’ imaginations run wild with a pirate or lookout theme; maybe your kids want to be able to change the theme of the tree house from time to time. Get the conversation going by drawing some sketches with the kids. Once you’ve decided on the design and theme, create a blueprint for the tree house and think about the supplies you’ll need. If you’re not confident in your carpentry skills, now may be the right time to bring in a builder. Generally, deck builders have the right materials and are willing to take on a tree house project. As you discuss your tree house plans with the builder, make sure you talk about safety. Prevent falls with handrails, which should be at the right height for the size of your children. 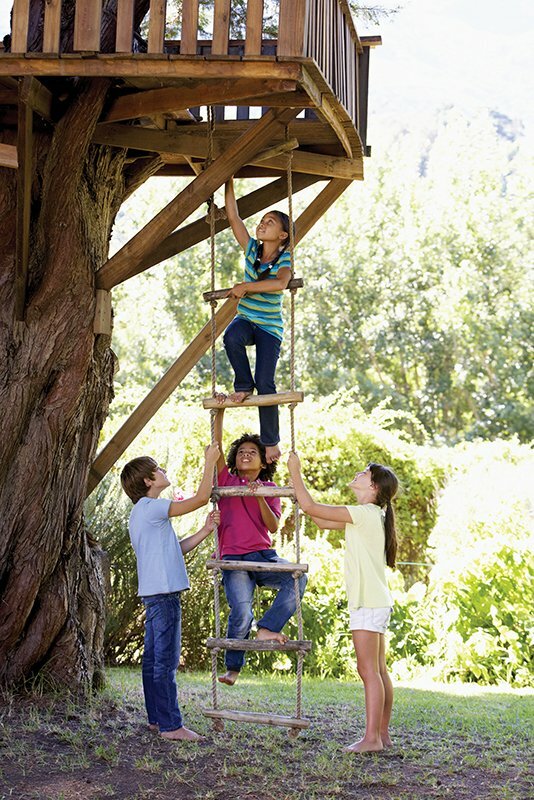 Find out how many kids the tree house will safely hold. Another question to ask yourself and to discuss with your builder is whether or not you want your kids’ tree house to be a “forever structure” or a short-term one. If you’d love to see your grandkids play in the tree house someday, consider building with ipe, also known as Brazilian walnut. Ipe is a hardwood that Mark Worley, of Your Favorite Builder, uses on decks as a less expensive (although still somewhat pricey) alternative to teak. It is harvested from managed farms and delivered to the job site. You might also consider using pressure-treated lumber, which is less expensive than ipe. Home supply stores can help with lumber selection. Worley suggests having the lumber stained and treated before installation. Rick Watson, Director of Product Information and Technical Services for Sherwin-Williams, says, “Stains often are self-priming and are applied directly to the wood, making it easier to re-coat. After priming the surface, follow manufacturers’ directions on re-coating. Some types of exotic woods, like mahogany, teak, ipe, meranti and ironwood, need special treatment.” For the tree house’s ladder, Watson recommends using a penetrating stain so the stain will soak into the wood and not leave a heavy film on top. One of his favorites is SuperDeck Log Home & Deck Stain. The interior of your kids’ tree house is as important as the exterior. Where some children will want cupboards, shelves, a table and chairs and window curtains inside their tree house, others will want nothing more than a built-in seat or waterproof box for prized possessions. Again, think about the theme of the tree house and the activities your kids will engage in while in their special hideaway. A tree house is a magical place; so whatever you build or have built for your kids, keep that magic — that escape — in mind.